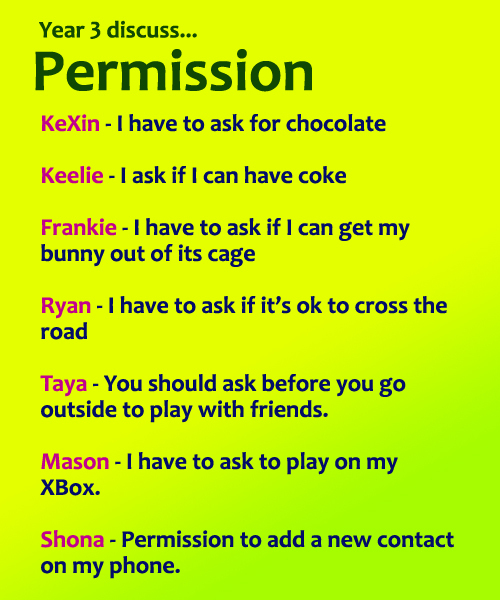 During Circle Time, Year 3 Bluebirds continued the Safer Internet Week theme – consent – Miss Timerick asked Bluebirds for examples of when they have to ask a parent or carer for permission. To do or have something. Taya – my friends have to ask to use my glitter. We also had quite a few children say their Mums asked if they could have some of their chocolate! In school, we thought about asking for permission in school such as asking for the toilet, whether you can have a drink, use a dictionary, go in the book corner, change a book, use coloured pens and if you can sharpen a pencil. Finally, the children were asked when do they need permission to do something online. Alexi – at school we have to ask Mr Baddhan if we can go on the internet or download/ print photos from the internet. Some children ask parents if they can go on to a game with an age restrictions.